Whether you’ve got a baby in the making or a toddler who’s leaving babyhood, this a great time to shift into greener gear, starting with your child's nursery. What you might consider a surface made for feet is your kids-whole-body playground, bed, desk, art studio and clothes hamper. So if you’re thinking about creating a healthy room that’s also eco-friendly, the floor’s not a bad place to start. Best of all is bare floor - carpet manufacture and disposal are major pollutants; and carpet traps dust, mold and allergens that do children no good. But if you want your baby to play on a soft, warm surface, there are options - read on. Remember Saturday mornings spent sprawled on spongy wall-to-wall, watching TV? Most likely it was synthetic - made of nylon, polyester and polypropylene, it was more affordable than wool, less itchy and miraculously stain resistant. But now we know that synthetic carpets release a toxic mix of formaldehyde, VOCs, benzyne and toluene into our indoor and outdoor air; trap dusts, molds and other allergens; siphon petroleum for their manufacture; and clog our landfills with four billion worn-out tons of non-biodegradable wall-to-wall per year. Still, things are looking up for synthetics on the eco front. Green Tag Plus carpeting uses lower-toxicity adhesives and padding. Some manufacturers are recycling old carpet (if you’re replacing old synthetic, ask your supplier about pick up) and making new backings out of recycled materials - check out Flor, which has a reasonably priced low-VOC child-specific line, FLORKids, that includes Disney themes. Pop-bottle carpet, made by, among others, Mohawk. PET, the plastic created from recycled soda bottles, is soft, tough, naturally stain resistant (and so gets no chemical treatment) and around $15 per square foot. And because synthetic materials absorb dye more readily than natural materials, it comes in a rainbow of saturated and pastel hues. Wool is more eco-friendly than synthetic. At an average $40 per square yard, it’s a bigger investment, too. But it lives far longer, so you can save money – and landfill - in the long run. And wool is also warm and insulating, so you spend less on heat bills and reduce your fuel waste. More on the plus side: Wool’s a renewable resource (the sheep keep growing it) and it’s biodegradable. Companies carrying the Wools of New Zealand mark are touting more environmentally friendly wool carpets - they use water-efficient processes for scouring the raw wool and low pesticide use where the flocks graze. Meridian’s fun Viewpoint series of New Zealand wool rugs was created especially for kids, and is based on children’s drawings. Non-chemically treated and non-moth-proofed wool (try Earthweave). Backings made of natural jute fiber or latex adhered with natural glues. Soft and durable, cork’s heyday was in the ‘50s and ‘60s, so if you’re aiming for a mod look that’s also enviro-friendly, consider the classic warm-toned tiles. Or check out some new styles: You can find cork in a variety of colors and patterns from sources like Globus. Cork flooring is a recycled product made from what’s left after the bark of the cork oak tree has been turned into wine-bottle stoppers. It’s naturally non-allergenic and fire-resistant, and if sea levels do rise, your floor will survive - fishermen use cork to float their nets. 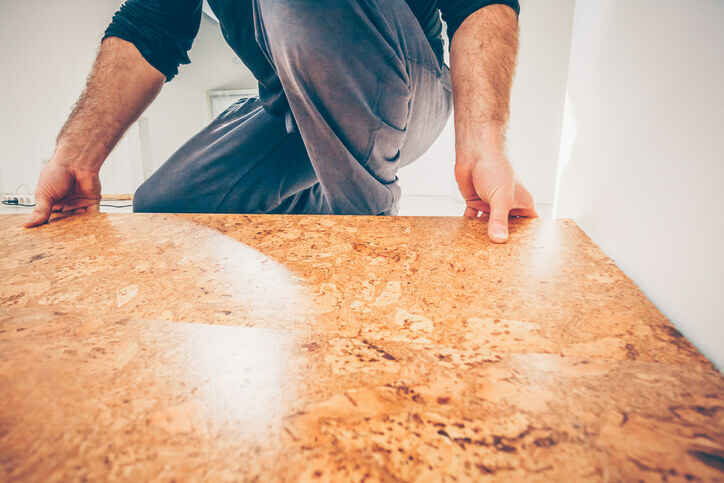 Cork can be used for insulation too; in the long run your energy bill savings could offset the cost of installation, around $4 per square foot. No- or low-VOC water-based adhesives and urethanes for gluing and finishing your tiles. Just because cotton is natural doesn’t mean it’s always green. It is sustainable and biodegradable; but cotton is one of the most heavily sprayed crops, and dying it guzzles water and can pollute streams. Environmentally friendly cotton products are going mainstream. Walmart is selling recycled-cotton shag rugs (around $2.25 per square foot). Recycled or organic cotton, un-dyed or vegetable-dyed. Get lots of green cred with Amish organic cotton rag rugs woven from scrap fabric, at The Natural Home. Green your rug even more by using a natural rubber grip pad underneath it. Babies spend at least 60 percent of their first year sleeping, breathing in whatever is emitted by her mattress, sheets, pillow, comforter, pad and other accouterments of the well-made bed. This fact alone has helped lead to the beginnings of big changes in the bedding department, with a move toward natural and chemical-free fibers. The byproduct: a healthier environment. Greener bedding could cost you more, but it will wear better and last much longer. Here’s the latest on non- (or at least less-) toxic mattresses, linens, blankets and pillows. We've all survived childhoods spent sleeping on mattresses filled with environmentally unfriendly, off-gassing, petrochemical-based synthetics like polyester and polyurethane foam, and treated with stain repellents, flame retardants and other breathable toxins. Still, if you’re planning a green bed for your kid, give the mattress priority. Some commercial manufacturers have started using naturally flame- resistant fibers like wool instead of chemicals to create retardant barriers in their mattresses. An added benefit: Wool helps regulate body temperature, making for a better sleep. If you want to avoid synthetics altogether, splurge on a true eco-mattress (Eco Baby has a selection at PureRest.com); these are filled either with cotton and wool batting over steel coils, or natural latex from rubber trees. Latex is the firmest option and has anti-allergenic and mold-resistant properties - plus, you could hand down that crib mattress multiple times and then reuse it as a floor pad, a durability that makes up for its higher price tag if there are likely to be more children in your future. A mattress made with environmentally friendly organic cotton and wool - if you see a Pure Grow sign, you’ll know the wool production practices emphasized sustainability. Easy-care polyester and poly-cotton blends are totally last century; now everyone wants 100-percent cotton sheets for their children as well as for themselves. But since manufacturers often give cotton a formaldehyde finish to prevent wrinkling, you might want to check out chemical-free linens. You’ll find traditional styles for kids on consumer sites devoted to allergy sufferers; if you’re looking for something more stylish than rabbits and bears (or soft pink and blue), visit stsome of the stores that cater to hip parents – you’ll find Boodalee and Kukunest formaldehyde-free cotton set at Modern Mini and Duc Duc’s. That doesn’t mean the cotton’s perfectly healthy though – not for the planet, at least. Cotton is one of the most heavily sprayed and treated crops – if you want top go one step greener, you’ll have to go organic. Organic lines for babies, made from super-soft unsprayed, untreated cotton, are suddenly everywhere – you’ll find them at Walmart and Babies “R” Us, as well as sites specializing in eco products. The knit variety can be washed in hot water and will still stretch over your thicker-than-vinyl wool puddle pads. [link to pads]. Grow Eco Bedding has pricey modern prints on organic cotton - you can even request color matching; Stokke organic also has some fresh-looking graphics. And you can buy new lines of stylish organic bedding by young design companies like Argington and Q Collection Junior. Undyed organic sheet sets – Natures Purest at Babies “R” Us uses unbleached and undyed organic cotton buds that are naturally cream, green and brown; another BRU line, the very bunnyish Bunny Meadow, uses a richer palette of natural dyes. Also check out the affordable BambooBaby sheet sets in supremely breathable, naturally antibacterial bamboo jersey, an eco-fave. A soft cloud of polyester-filled pillow, comforter and bumper looks great on your toddler bed (though the fluffiness tends to vanish after multiple machine washes). Eco versions aren’t as puffy, but they have their own charm - something like your old teddy bear’s. And they're perfect for babies, who shouldn't sleep in clouds for safety sake. Bumpers filled with organic cotton or wool and pillows stuffed with finely shredded rubber; recycled-fleece-filled comforters, organic felted wool or cotton-and-rubber puddle pads (at Good Night Naturals); and wool or cotton blankets (everywhere) – there’s a whole world of green baby options. You can even find colorful crib- and twin-size blankets made of old blue jeans and wool sweaters at Abundant Earth. Easy-wash varieties of the above: wool puddle pads you can throw in the machine (satara-inc.com) and a machine-washable organic cotton bumper pad at Dream Soft Bedware are relatively new to the eco scene. Carpets and paints have gotten a bad rap on environmental issues, while baby and kid furnishings have been largely untouched by the eco cops. Meanwhile, aisles upon aisles of pretty cribs and changing tables, dressers and rockers, toy boxes and mini chairs - many of which will be tossed after just a couple of years - are depleting our forests, clogging our landfills, making giant carbon footprints in production and off-gassing. Seek out green pieces – think bent or molded plywood, which is a low-waste product, and sustainable woods. There are some wonderfully innovative pieces out there created by young mom-and-pop design companies that consider the environmental impact of every stage in their process, from the materials themselves to packing and trucking. A crib has to be strong enough for you to trust it with your sleeping child, even after thousands of hours of use. Simple designs made of solid hardwood tend to do the job best. They also tend to be the soundest environmentally, as do cribs finished with nontoxic paint or sealant - a good choice health-wise, since the top rail is likely to double as a teething aid. Toddler beds follow the same principle: simple designs spell longevity, while that novelty race-car or princess bed’s cute factor is very age-specific. Many of the coolest and greenest cribs emerging from the drawing boards of young eco-design firms are created to do double duty - add an optional piece here and there, and your crib serves as a changing table or gives you extra storage. They’re also adaptable. As your kid grows, you can reconfigure the crib to be a toddler bed, youth bed, sofa and even chairs (you will probably have to buy a separate manufacturer’s kit to do so). That’s a saving of resources - yours and the planet’s. For growable sustainable furnishings, check out Argington, Duc Duc , Oeuf, Stokke and Nurseryworks. More reasonably priced convertible - but not sustainable or nontoxic – you’ll find a few at Target. Adaptable cribs and beds built with hardwoods from managed forests; some, including a line from Q Collection Junior, are certified by the Forest Stewardship Council. These tend to be pricey, but slightly less green, lower-budget versions are available (think Ikea). You can find pretty much any style in mini furnishings for kids. Just as in the grown-up world, what’s considered stylish now is clean-lined, modern and playful – all good eco qualities. That means plastics are out, plywood is in; so is any natural wood, making a simple vintage piece a good find (toy chests must meet federal safety standards; watch out for lead paint). For simple nursery chairs and tables made from birch and birch ply that’s not from intact natural forests, check out Ikea. Back when you were a kid, the plywood and engineered woods (composite board, particle board, MDF or fiberboard) that were used to make your little tables and chairs were bound with toxic formaldehyde-based glues. Since the ‘80s, manufacturers have gradually reduced the level of VOCs in these products; they’ve also paid more attention to sealing the woods to minimize off-gassing. And today, some children’s furniture designers are using woods bound with new nontoxic glues. The greenest is the simplest – it uses the minimum amount of wood, has nontoxic adhesives and finishes, and comes flat-packed (less packing material). Check out Ecotots. Pieces made with a steel or wood frame and organic cotton (check out the baby bouncers at Ouef and Nest). If you’re thinking tiny armchairs, look at the Landing Pad’s soft seating stuffed with eco-fleece made from recycled soda bottles instead of off-gassing foam. Super inventive design company Foldschool makes basic but totally green mini pieces from folded cardboard, and Pallet Art makes whimsical furnishings and accessorizes from discarded shipping pallets. Any solid wood dresser, repainted with nontoxic color if necessary, can work in a child’s room, but if you’re buying a new one, think about making it work as a changing table too, and consider how it will look in a few years’ time when the crib’s turned into a bed and the bears have been displaced by robots. Clean design is one solution. Innovative young designers (moms and pops themselves) have come up with solid wood changing tables that are also simple dressers. Some have designed changing boards that attach to the top of a crib. Tables made of natural woods, and nontoxic glues if the product has MDF or particleboard components. Baby's Green Walls: How eco is your paint job? A coat of paint has to flow smoothly, cover well, dry efficiently, look good, wipe clean and resist mold and mildew. The substances that have traditionally helped paint do these things add up to a long list of chemicals and other toxins that continue to off-gas, or release, into the environment long after your nose stops noticing. But companies have started figuring out how to produce paints that get the job done without fuming us out of the house. So, read up on low- and no-VOC paints, ceramic paints, organic paints, recycled paints, and low-impact wall coverings. Oil-based paint is the biggest VOC culprit, so even for woodwork and trim, opt for latex instead - the newer low-VOC latex versions, which contain less smelly solvent than their predecessors, are capable of providing a hard, enamel-like coat, cost around the same as regular paint and come in a full range of colors. Higher still on the eco scale, and as much as double the price, are zero-VOC paints (if you add pigment in the paint store, you add VOCs; If you want to keep those compounds to a minimum, go for the lighter shades). Choosing paints with low or no VOCs helps reduce contaminants in the atmosphere, as well as in our landfills. Look for the Green Seal stamp on the side of the can. This voluntary certification program has established a standard of 50 grams per liter for flat paint or 150 grams for oils. Green Seal calls paint zero-VOC when it contains under five grams per liter. For nontoxic, washable interior paints that spread well and are great nursery colors, check out Yolo Colorhouse’s Little Yolo. Ceramic paint is the latest development on the less-toxic scene, and it’s great for kids rooms. Made by suspending minuscule ceramic beads in a latex base, the paint has a hard, scrubbable surface. Hand-prints and crayon scribbles? No problem. All ceramic paints are amazingly durable - and the less often you have to repaint, the fewer vapors end up in the environment. They also insulate against cold and heat. Paints that contain no chemical preservatives - the tough ceramic paint surface is naturally resistant to mold and mildew. O’Leary’s Ceramic Coat has had good reviews but contains anti-microbials, which can be toxic. Hy-Tech makes an unadulterated ceramic additive that you mix into your paint. Organics are the earth mamas of paints: They’re made with substances like milk protein, lime, beeswax and natural oils, instead of from petrochemicals, and are free not only from VOCs, but also from other chemicals, including those that contribute to good flow and coverage - which is why most organic paints don’t perform the way conventional ones do (expect some progress on this in the near future). Neither will you find a bubble-gum pink or lime green among them, since they’re pigmented with pure mineral dyes. Still, if you’re going for a vintage-style nursery or a bent-ply look and don’t mind the higher price tag, you can’t get much healthier than these paints. For a nursery range, check out BioShield’s Kinder Paint line. Organic paint manufacture, besides being petrochemical free, is also low-waste and uses energy-efficient machinery. Some companies, including Livos, take the extra step of recycling the water that’s used in the process. Look at the content label: It should list no preservatives, fungicides or bactericides, all of which can contain toxins. Working with a small paint budget but still want to help the environment? Think about using inexpensive recycled latex. Manufacturers reprocess leftover product, usually blending it with new paint - anywhere from 20 to 80 percent - to make a range of colors. The greater the balance of new to recycled, the purer the colors you’ll get and the whiter the whites. Just remember, this is not a low-VOC product, so take care to air the room for a long time before baby uses it. Some municipalities have established recycling centers for household paint, or are in the process of doing so. Check locally, also, for companies that recycle paint and accept drop-offs. Those that carry the Green Seal stamp for recycled paint. Certified products in this category meet requirements for environmentally sound manufacturing, but not for VOCs. Since most recycled paint is sold in the same area where it is produced, check for availability at your local paint store. Paper, ink, adhesive - these are not a recipe for environmental health. Among the problems they raise are toxic ink discharge and waste disposal, along with VOCs emitted by the wallpaper paste. Still, if you’re into pattern (and want to indulge your baby’s fascination with it) or need to hide an ugly surface, you’ll be glad to know that things are changing in the world of wall coverings. The wallpaper industry has reduced the amount of solvents in its products, and a new low-VOC paste is available. Or you can use this recipe to make your own paste. Some manufacturers are using recycled paper (and even recycled pantyhose) and renewable pulps to make wall coverings. Among them are playfully embossed self-adhesive wall flats made out of bamboo pulp - a renewable resource - as well as some fun animal-shaped DIY recycled-wallpaper kits. These products are designed for adults; kiddie wallpapers are less likely to be green - or as cool looking. Another option: use low-VOC chalkboard paint or whiteboard paint to make a large blank canvas on your baby’s wall; soon enough, she’ll be able decorate her own room with colored chalk or whiteboard markers. You can't even get magnetic chalkboard paint!